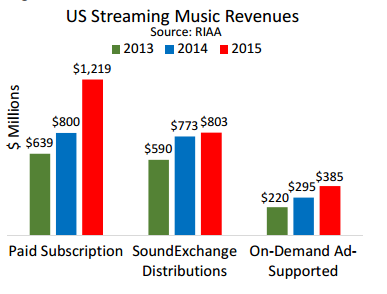 RIAA’s 2015 year-end Music Sales & Shipments Report shows total retail income from recorded music in the U.S. increasing 0.9 percent to $7.02 billion ($4.95 billion wholesale). Streaming—led by paid subscription models, which grew 40 percent in paid subscribers—clocked in at $2.4 billion, slightly outperforming physical and download sales to become the largest revenue-generator for the U.S. recording industry. 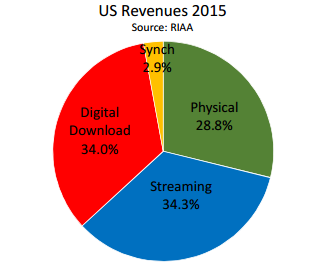 Streaming, permanent downloads and physical sales are “the most balanced revenue mix in recent history, with just about 1/3 of revenues coming from each of the major platform,” cites Joshua Friedlander, RIAA’s Sr. VP of Strategic Data Analysis. Thus, permanently downloaded albums declined 7 percent from the previous year (5 percent decline in dollar value), while single-track downloads declined 15 percent (13 percent decline in dollar value). The report continues, noting SoundExchange distributions grew 4 percent to $803 million, and on-demand ad-supported streaming grew 31 percent year-over-year to $385 million. 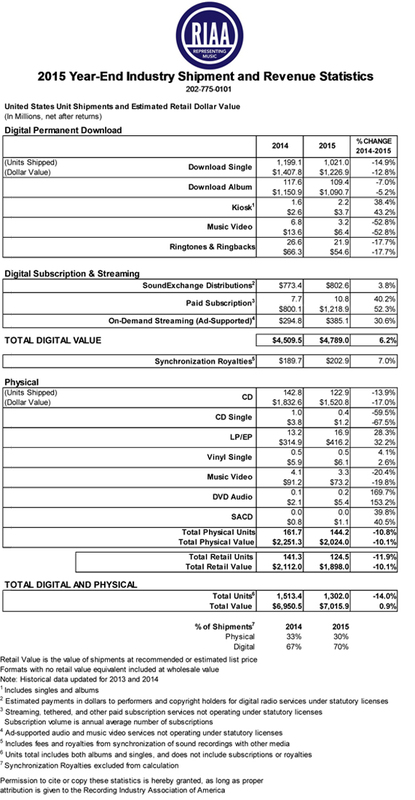 Sync royalties grew 7 percent to $203 million. highest level since 1988. Synchronization royalties were $203 million, up 7 percent versus the prior year. Another headline? In 2015, digital music subscription services reached new all-time highs, generating more than $1 billion in revenues for the first time, and averaging nearly 11 million paid subscriptions for the year. Heading into 2016, the number of subscriptions swelled even higher — more than 13 million by the end of December — holding great promise for this year. While today’s data is encouraging, the challenges facing us are significant. The consumption of music is skyrocketing, but revenues for creators have not kept pace. In 2015, fans listened to hundreds of billions of audio and video music streams through on-demand ad-supported digital services like YouTube, but revenues from such services have been meager — far less than other kinds of music services. Need further proof that some fundamental market distortions are at play? Last year, 17 million vinyl albums, a legacy format enjoying a bit of a resurgence, generated more revenues than billions and billions of on-demand free streams: $416 million compared to $385 million for on-demand free streams. I’m confident that music’s future is bright. The popularity of music is greater than ever. Like never before, it drives our culture and commerce. It is the throbbing heartbeat of social media and it is a must-have ingredient of any major technology platform. But reforms are necessary to level the playing field and ensure that the entire music community derives the full and fair value of our work.